I want to make a 9" finished size log cabin block and am having a bit of a problem. 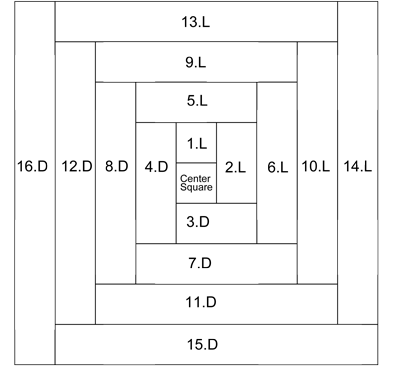 What size should the center be and what size should "logs" be to attain the finished size. I went ahead and drafted instructions for two versions of the block--one with all the strips cut an even width, and one with a larger center square. UPDATE: I've added another page to the website that includes a step-by-step tutorial to piece a log cabin block, as well as a Cutting Chart to download for a Log Cabin with 5 rounds of log for 1", 1 1/4" and 1 1/2" finished strips. There's also a coloring page for the block. Click here to go to that page now. When I construct Log Cabin quilt blocks, I add the first patch to the right side of the center square. Next press the unit, first with it closed to set the seam, then press the unit open with the seam allowances to the dark (or in this case, red) side. Back at my sewing machine, I then rotate the unit 1/4 turn to the left and add the next patch to the right side. All seam allowances are 1/4 inch. Continue in this manner until all the patches have been added. Your block will measure 9-1/2" unfinished. This rendition of the block is made from a small center square and four rounds of logs. Cut your light and dark (in my example, red) fabrics into 1-1/2" cross grain strips. Except for the first and last piece, you'll be sub-cutting both a dark and a light patch to the same length. Notice that the block is slightly asymmetrical; there is more of the dark fabric than the light. 1.L Light 1 1-1/2" x 1-1/2"
2.L Light 2 2-1/2" x 1-1/2"
3.D Dark 1 2-1/2" x 1-1/2"
4.D Dark 2 3-1/2" x 1-1/2"
5.L Light 3 3-1/2" x 1-1/2"
6.L Light 4 4-1/2" x 1-1/2"
7.D Dark 3 4-1/2" x 1-1/2"
8.D Dark 4 5-1/2" x 1-1/2"
9.L Light 5 5-1/2" x 1-1/2"
10.L Light 6 6-1/2" x 1-1/2"
11.D Dark 5 6-1/2" x 1-1/2"
12.D Dark 6 7-1/2" x 1-1/2"
13.L Light 7 7-1/2" x 1-1/2"
14.L Light 8 8-1/2" x 1-1/2"
15.D Dark 7 8-1/2" x 1-1/2"
16.D Dark 8 9-1/2" x 1-1/2"
The diagram below shows the position of the patches and the order of piecing. Piece 1.L is added first and is a light patch. Piece 4.D is the fourth patch added and is cut from a dark fabric. 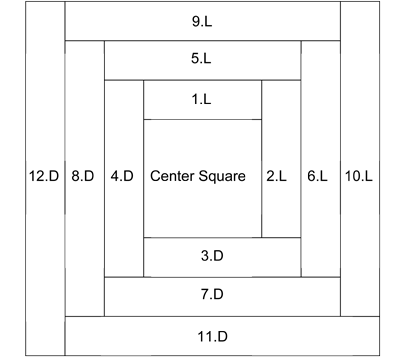 In this block the center square is much larger. It takes just three rounds of logs to complete so it's faster than the first block. After cutting your 3-1/2" square for the center, cut your light and dark strips into 1-1/2" strips. This block is also slightly asymmetrical. 1.L Light 1 3-1/2" x 1-1/2"
2.L Light 2 4-1/2" x 1-1/2"
3.D Dark 1 4-1/2" x 1-1/2"
4.D Dark 2 5-1/2" x 1-1/2"
5.L Light 3 5-1/2" x 1-1/2"
6.L Light 4 6-1/2" x 1-1/2"
7.D Dark 3 6-1/2" x 1-1/2"
8.D Dark 4 7-1/2" x 1-1/2"
9.L Light 5 7-1/2" x 1-1/2"
10.L Light 6 8-1/2" x 1-1/2"
11.D Dark 5 8-1/2" x 1-1/2"
12.D Dark 6 9-1/2" x 1-1/2"
The following diagram shows the placement of the patches. 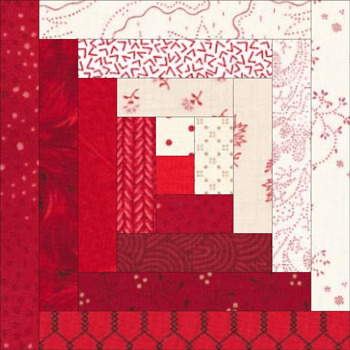 For ideas for laying out your 9" Log Cabin blocks check out Log Cabin Quilt Designs. SO SO Easy with your instructions. 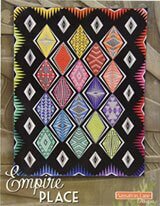 Thank you as I also am new to machine quilting and really love this pattern, but could not figure out how to do this. Thank you coolio much for all your great advice, and for doing the math! 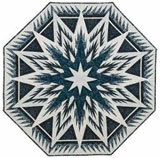 I want to do a lot cabin quilt with the larger center that will end up being 10" square. I bought the shiny Michael Miller Frost line and that will be so cool as all one color family in one side and a paler color family on the other side. It didn't come in red so I am not sure which one to choose for the center. I'm getting ready to make my oldest son a quilt. He lives in a cabin, so this will be perfect. It's the easiest and clearest instructions I have found. Thank you. Finally, very good instructions on how to make the block. I've been all over the web. this is the best one. Thank you for your patterns and guides. I have just retired and have always enjoyed quilting. Now I have the time to "stitch" away my days! Thank you for your chart. I am going to try to make a "quilt as you go" quilt from these instructions, they are very detailed. I looked everywhere on the internet for these instructions! THANK YOU SO MUCH!!!! log cabin is on my list. 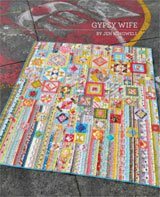 I just realized that your's is one of the 1st sites I found when I started to learn quilting about 4 years ago. I have been using your block patterns ever since. Many thanks for the patterns and the many tips. You have been a great help in my quilting adventure. 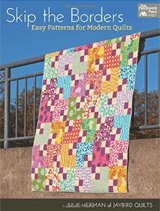 So helpful to a Quilter. I´m a beginner from Brazil. Your comments and diagrams will help me in a new project. Do you have the measure units in the metric system? I'd like to make the block with 3 1/2" center square. Hi Elizabeth! Unfortunately the only rulers I have access to are in inches. I feel uncomfortable providing metric measurements without testing them first. I noticed where someone asked you about instructions for 12 1/2" blocks, but never got back to you. I would also be interested in those! I would like my blocks to be 12 1/2" finished with at least two inch strips, and I would prefer the smaller center square. I appreciate, so much, your taking the time to help others! From the Edit: Hi Kelli! Quick question. 2" finished strips or 2-1/2" finished strips? I was so completely happy to find your site after searching so much on the internet. Your comments and diagrams are priceless, easy to follow and "user friendly." Thank you so very much, what a delight to find someone like you to take the patience to help others. Looking forward to the "new math" guides this fall and..got a kick out of "piecefully" in your reply. I'm a new to quilting and wanted to start with a log cabin quilt to give to some friends. I've bought a book but the directions were not nearly so user friendly as your list and chart. From the Editor: You're welcome, Cindy! Thank you so much for taking the time to write. 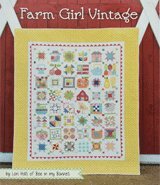 Coming some time in the fall (after quilt show season) I'll be adding more pages about Log Cabin quilts. One of them will have the math done for several other sizes. 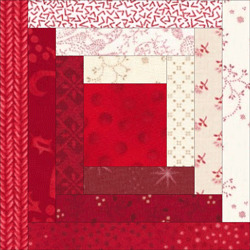 Another will be paper piecing patterns (free to download) for smaller blocks with smaller logs. Again, thank you! It's pretty cool to wake up on a Saturday morning and know that I've been able to help someone! I would like to make a 12.5" block with a bigger center with just rounds of logs. Can you give the instructions for that? From the Editor: Not a problems, just need a bit of extra information. How big a center do you want/need? What size logs/strips do you prefer to work with? You'll need to let me know whether it's the finished or unfinished width. It is a 12-1/2" finished block or is 12-1/2" the unfinished size? Once I have that information, it's easy-peasy to do for you! Thanks for doing this diagram. I want to make a log cabin quilt for my son and you have given me two options with instructions and pictures. This has made it so easy. From the Editor: You're Welcome! Glad it helps! Hi, I have been tearing my hair out trying to design this on a (well-known) software program....I am using log cabin blocks for a QOV quilt with a log cabin star layout. Thanks for doing the math! Thank you so much for the nice diagram and instructions on making this block! I think I am going to give it a try ! I love the red and white, too!